This is as good an image to talk about as any. It’s the first work I came across by the American artist Kathleen McEnery (1888-1971). I included it in a small exhibition I curated at the Memorial Art Gallery, Rochester, in 1995, of images of women, as part of a larger project celebrating the 75th anniversary of women’s suffrage in the U.S. After that I became interested in her work and life. 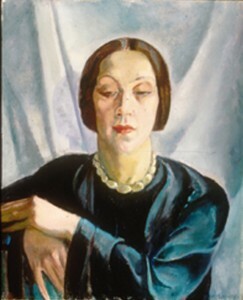 Through contact with her family (her son Peter – the only one of her three children still alive at the time, though he died in 2003 – and twelve of her many grandchildren) I was able to see more than a hundred and twenty of her paintings. With the invaluable help of Lucy Curzon, then a graduate student in VCS, I curated an exhibition of her work at the Hartnett Gallery in 2003, and later helped Nanette Salomon curate another McEnery exhibition at the Gallery of the College of Staten Island, in April 2005. 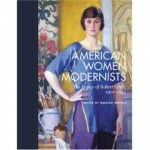 And later that year McEnery was included in a major exhibition of the “new women” art students of Robert Henri at Brigham Young University Museum of Art; her self-portrait featured on the cover of the catalogue. (and two other portraits of Allen on display, in the Eastman Theatre and in the MAG library). Finding McEnery meant that I spent much of my last year in Rochester (2000-2001) learning a good deal about George Eastman’s city – a great cultural centre in the 1920s and 1930s. 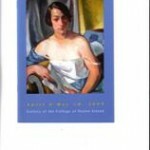 I wrote an essay about McEnery in my book AngloModern (2003), with a still life of hers on the cover. Now I’m writing something in a more personal vein about the people I learned about during that period of research, some of whom I interviewed when they were in their 90s. Janet Wolff: I was Director of VCS from 1991 to 2001. Before that, I taught at the University of Leeds (UK) for fifteen years. In 2001 I went to Columbia University, where I was Associate Dean for Academic Affairs in the School of the Arts. In 2006 I moved back to England, and am now Director of the Centre for Interdisciplinary Research in the Arts at the University of Manchester (so I’m also back in my home town). My two most recent books are AngloModern: Painting and Modernity in Britain and the United States (2003) and The Aesthetics of Uncertainty (2008). Now I’m writing a book which is a combination of memoir, family history, and cultural history, with photos, facsimile documents, paintings and other images. Copyright vcs20th. All Rights Reserved.